We don't get much snow down here in Maryland but we did get enough to go out and play in it on Sunday, January 21. 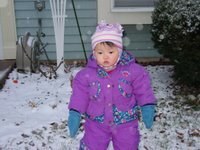 The snow was covering the grass and sidewalks so we got Sophia bundled up and Kaegogi harnessed. 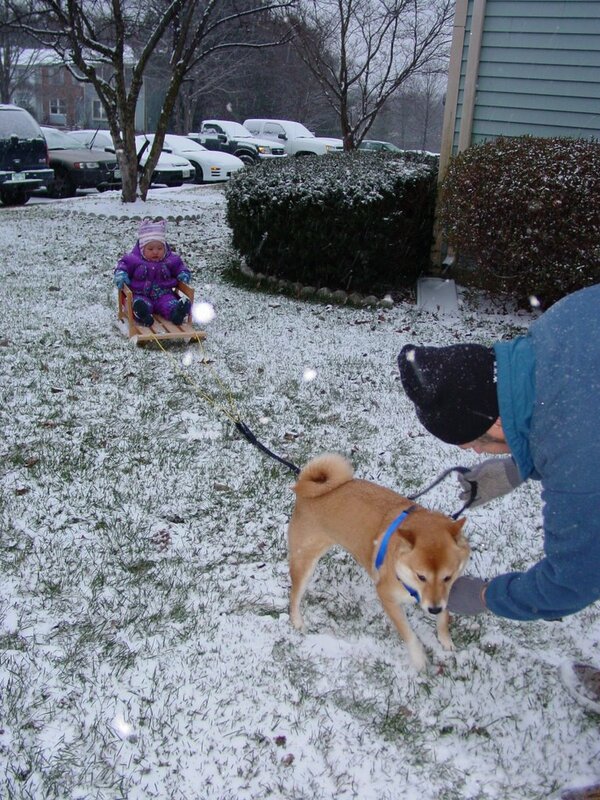 Steve's coworker let him borrow a small sled for Sophia and Kaegogi pulled her on sled. Actually Steve did most of the pulling but don't let Kaegogi or Sophia know that! Sophia was unsure of the snow. She fell face first into it right away. The bulky snowpants, coat, mittens and hat, not to mention the big, heavy boots are hard to manage for a tiny 13 month old!! She was not at all happy. However, true to her spirit, she stopped crying right away and gave it another shot. She loved being pulled by Kaegogi. Her face lit up as they slid down a small hill. Overall, the snow was a lot of fun. We hope to get more snow so we can go sledding again. Maybe this time we will have enough to build a snowman.